The fifth World Championship race in as many weeks appeared to take a toll on drivers and teams as only 14 cars took part in the Belgian Grand Prix at Spa. Once again, the race was dominated by the trio of Alfa Romeos driven by Nino Farina, Juan-Manuel Fangio and Luigi Fagioli. The main challenge all year came from Ferrari but their four entries in Switzerland reduced to two - Luigi Villoresi and Alberto Ascari, the latter with a new V12 engine. 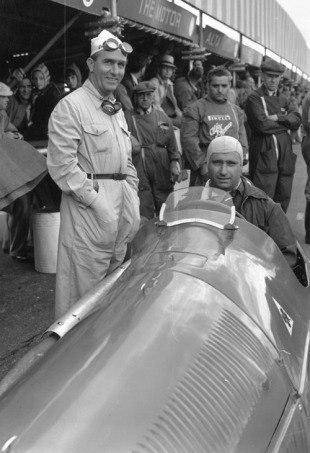 Farina and Fangio dominated practice, and the grand prix itself followed the same pattern. Briefly, Raymond Sommer in a Talbot-Lago led the field as the Alfas pitted, but his engine blew soon after the halfway point. Ascari then took the lead but when he too pitted the Alfas went ahead again with eventual winner Fangio leading Farina and Fagioli. Farina suffered transmission trouble in the closing laps and dropped to fourth behind the best of the surviving Talbot Lagos being driven by Louis Rosier. In the event, Farina's fourth was crucial in helping him win the drivers' title. Ascari, whose father had won the inaugural Belgian Grand Prix in 1925, came fifth. Although the Alfas appeared unbeatable, this race showed their fuel consumption, which was considerably higher than their rivals, was a major drawback, and one which Ferrari were quick to exploit in 1951.